Raymarine’s Ray52 Fixed Mount VHF provides a bright LCD display making viewing in any condition convenient. With a 72 channel WAAS GPS receiver built-in, installation of the Vhf is simple and straightforward. 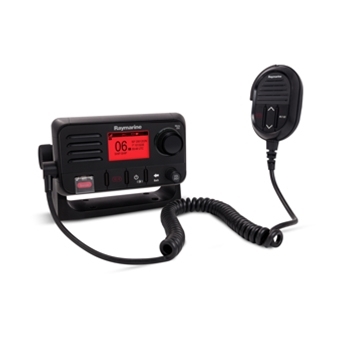 Equipped with a class D Digital selective calling (DSC), the Ray 52 includes a dedicated channel (Channel 70) for monitoring all Distress calls and allows you to program your MMSI number into the ray 52 providing you the safety and peace of mind knowing your boats information and position will be relayed to all other vessels in your area in case of distress calling. With NMEA 2000 and 0183, networking to your current system is simple. With the space saving design allows you to install the unit on almost any dash that’s available. The Ray52 boasts a wide variety of standard features including NOAA weather alert, dual-watch, tri-watch, scanning, selective scanning, and much more. You will not have to compromise with the Ray 52. Providing 25 watts of transmitting power, the Ray 52 also provides a quality speaker for outstanding audio even at high volumes. With simple to use controls and an easy operating system the Ray 52 is a top contender in Marine VHF Radios.